I can't get the call_data to work. I have set up sub-folder(s) in call _data with the folder called (callsign) where this is the call e.g. OK1RR and then added a gedit txt file/document to the folder. From the logging screen when I input the call nothing appears as an attachment so maybe I have not got the system path set up for the viewers. According the help file "viewer must be in the system path". I thought checking the OK for each viewer in the Preferences did this but maybe not? Any help on how to do this appreciated. As I have never tested this it was interesting to try. In my system the "folder"-button has no graphic content, but works. See attached file. I (wrongly) used upper case for call sign folders so will go back and rename them in lower case and see what happens after reboot. Will report back. Appreciate the reply. You said that you use CW type and save the whole qso. Have you tried Ctrl+N when NewQSQ window is open? It is faster way to record things than putting them to call specified folder. When in CW type window paint the whole text. Switch to NewQSO window and press Ctrl+N , long note opens. place mouse cursor over long note and press wheel button. Text goes to long note. Note: doing this with wheel button erases previous content. If you want to save old content, when being in CW Type window where text is painted press Ctrl+C. Close long note and save qso. Your long note is there. Does not work. I have tried several times. I wonder if this is why when I try "Control I" this shows empty Details window even though I have FOC members callsign list and members name enabled? 1) Long info is long text info for log entry. Can edited and read. Saved in to database. 2) Details. For me this is always empty. I do not know what is this for. It seems to have (by help) some relation of clublogs that I do not use at all. So I can not get any content for this in any way. 3) Buttons "folder" and "qsl". 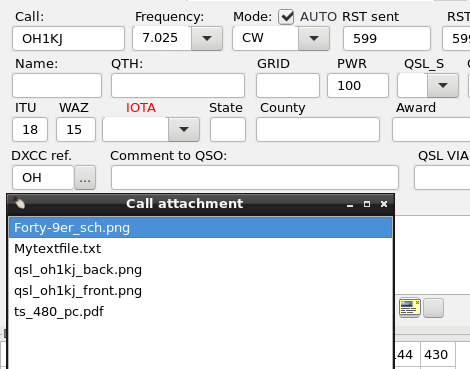 They open either qsl image window or list of files window for "callsign" saved under ~/.config/cqrlog/call_data/callsign. These work if folder has named using lowcase callsign entered to NewQSO/Call. You have call: G4AFU in picture and empty call attachment. do you have directory ~/.config/cqrlog/call_data/g4afu ? And at least one file there. Clear call from NewQSO/Call (double ESCs) NOTE: Call attachment window must be closed first. Type call G4AFU to NewQSO/Call. Exit from NewQSO/Call field (by Tab or mouse) to any other field. Press the folder button below "Comment to callsign" (button without image) and you should now see "textfile.txt" in attachments window. I made that just while typing this message so it should work that way. 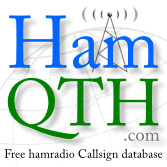 For me it worked without restarting cqrlog, but I had there already another callsign-folder. So you may try to restart cqrlog if textfile.txt is not in attachment list, but it seems to be not necessary. Thank you for your patience with this. I did not give the file name a .txt suffix in the /call_data/g4afu/ folder. I have now gone back and renamed the file testdoc.txt (using mv command) and it works OK. Lesson learned. see attachment.